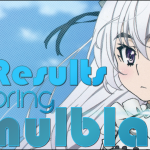 Our contestants take up the ancient art of screenshots in this week’s Simulblast! You’ll laugh, you’ll cry, and you’ll finally get to see through the eyes of our reviewers, for better or worse! This week’s challenge: Get your print screen buttons ready! This week’s challenge is to take one screenshot from your episode that you think sums up the episode the best! Be sure to keep it clean! The episode begins with our trio looking for magic fuel, but there’s a festival in town so all the shops are closed. Magic fuel apparently powers their vehicle, and as such they’re sort of in a pinch. Apparently Chaika can use her memories instead, but Toru isn’t fond of this idea since it might be the major reason she can’t remember anything about her past. In other news, Guy is essentially spying on Alberic in another city. Through some shared dialogue we find out about all of his crew and how much they suffered through the war. Since I really don’t care about these characters, it’s kind of a wasted scene. They receive urgent orders and have to stop reminiscing. In addition, it’s time for our heroes to think back on their life. Toru and Akari apparently trained their entire life as saboteurs. Their entire being was being able to prove their worth on the battlefield. Apparently Toru had a mentor named Shin who essentially said he sucked; in addition, Akari was called stubborn. The two begin to fight and sling water at one another due to some moments they remember. They finally find a man with a shop open to get ahold of some magic fuel. 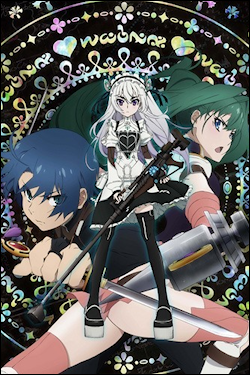 Toru talks with Chaika in the meantime about friends he knew during the war who died. He discovered an older woman named Hasumin whose husband died as they traveled between his village and others. She had been attacked by bandits, but the village elders slaughtered all the bandits. 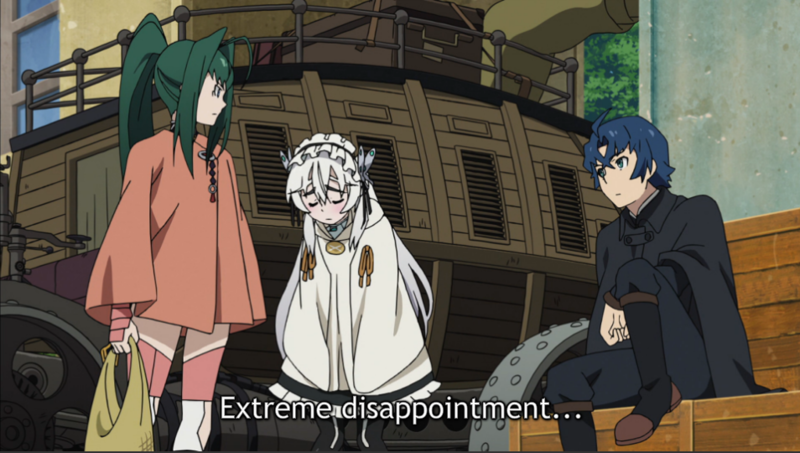 Toru states he’s unable to save people due to that, but Chaika corrects him since he saved her prior. I realize that this an excuse for backstory (and for a chibi Toru), but so far this episode hasn’t proved much besides filling in a wandering blank or two. None of the information is super valuable, but the shop owner leads them on the trail to the next piece of remains. This episode was just boring… I just wasn’t impressed with what was going on. Okay, okay please don’t blow us up with nukes! Wait, I should probably explain. 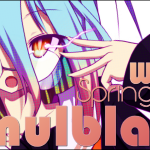 Episode nine of Simulblast is here! 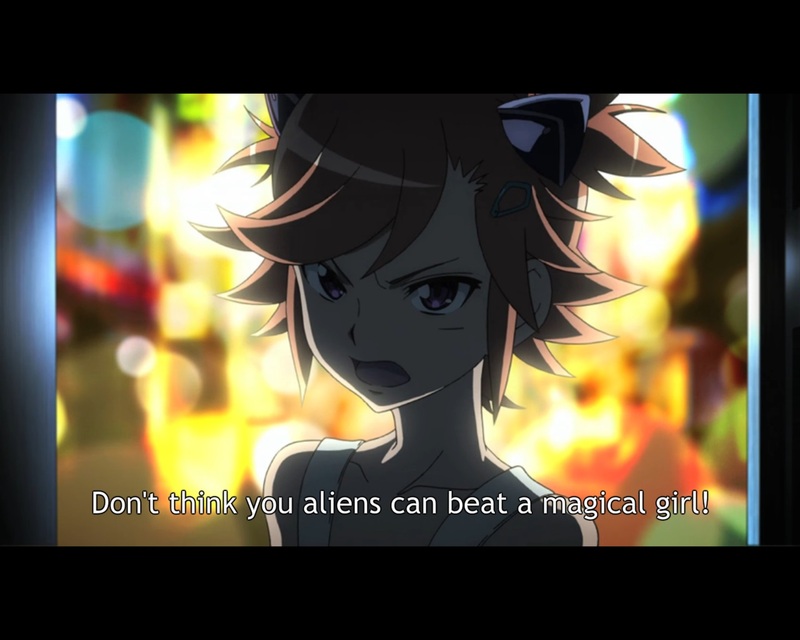 I hope you’re ready for some robotic magical girl action, because it is an Akari episode, everybody. We learn that a new Kiltgang may be activated in the Shinjuku area of Japan, so our heroes do everything they can to find this new threat by eating pancakes! …Wait. So while our heroes are eating pancakes they try to figure out who the next Kiltgang may be, but suddenly all the screens everywhere in Shinjuku are showing the exact same music video from a blonde-haired idol. It is literally throwing it in our faces. Akari says she has to go get a new computer because hers exploded in the last mission. Teppei offers to go with her to protect her, but Akari says finding the Kiltgang is far more important. Teppei insists, but she says she is able to take care of herself and heads off. Tappei believes he is the only one contributing to the team. Cut to the idol that was being shown on TVs everywhere, who is having trouble focusing and thinks that everyone hates her. If you couldn’t tell she was the Kiltgang at the beginning of the episode, then I don’t know what to tell you, man. Her manager tries to make her feel better, but nothing seems to get to her. In enters Moco who goes in for the activation kiss, and in comes our newest enemy Aivatar. While this is going on, Amarok and the Kiltgang from the previous episode are now attempting to kidnap Akari. Akari tries running but doesn’t get far. Now that Akari has been kidnapped, the operation is about to begin as they use her to hack into all of Globes systems and turn off their planetary defense systems. Back at the Globe train, Peter Westvillage tells us that the weak points for the Kiltgangs Goodfellows is their heads… Well, the head is a given weak point, so yeah. We also learn that, if three minutes and fifty five seconds go by after their activation, they become a full Kiltgang, and there goes the planet. 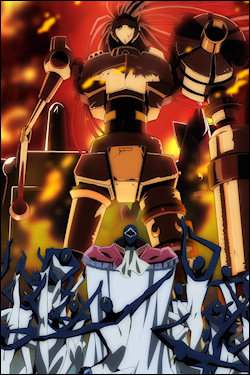 Daichi goes to fight Aivatar who is in a new, long range type Goodfellow with twin laser canons on it’s shoulders; Almost looks like a Gundam to me, actually. As the battle heats up, Akari is being held at gunpoint and is asked to activate Globe HQ’s self destruct sequence. Daichi’s weapons are now all gone as his guns are shot right out of his hands, and he is now missing an arm. He now only has one weapon left: his LivLaster. He opens his cockpit mid air and aims his LivLaster straight for the robot’s head. The laser is blocked by Aivatar’s shield, but Daichi pushes through by activating a new mode for the laser. A part of the gun sticks out and glows blue, and the laser is given more power. It busts through the shield and knocks the Goodfellow’s head clean off. And with 3 seconds to spare. 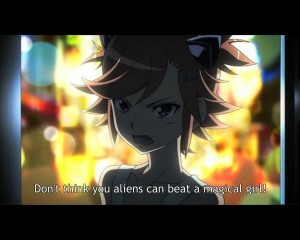 So the moral of this weeks episode is don’t mess with Akari… ever! She was about ready to destroy all of humanity. Jesus! This is who we are hiring to protect us! But she did get the job done, so good job. Even though you almost wiped us out. 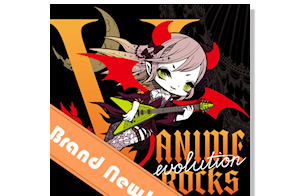 Join us again in episode 10! Let me preface this with the fact I’ve been attacked! I had to rewrite my article and for that reason some of the phrasing might look a little off as I had to go for originality compared to my first version. It is our tenth turn at this season of anime, and I, Elk, master of everything awesome, am bringing you this look into the Bizarre Adventures of the Joestar family. At the end of episode nine we learned from a creepy TV message that Kakyoin is still Dio’s servant and that he should be beware. So of course we’ve got a recap to freshen our memory. Not only that, but we also see him brutalize a petty thief while JoJo tells him to stop. Whenever you need a moment to rock out, just remember to Stand Proud. Awww yeah. Gotta love this opening. Kakyoin excuses the fact that he just nearly killed a guy as him being in a bad mood. JoJo sees through his facade but does nothing about it. Anne (the name of the previously unnamed girl) sees a few kids looking at some beetles. While JoJo isn’t watching, Kakyoin devours the beetles and looks extremely creepy doing so. Understandably, Anne is really creeped out by this and runs forward to catch up with JoJo. Honestly, it’s kind of silly that they just show him doing these “Evil” things instead of having him be more of a serious threat, but these are “Bizarre” adventures, so I’ll give them that. This time, however, JoJo isn’t having any of Kakyoin’s shenanigans, so he gives Kakyoin a punch that sends him flying. His face also rips apart from the punch, which surprises JoJo. Turns out Kakyoin isn’t actually Kakyoin but Yellow Temperance, a new enemy Stand user. While all of this is going on, Anne calls Joseph and Avdol to let them know what’s happening with Kakyoin while JoJo and Yellow fight on a cable car. 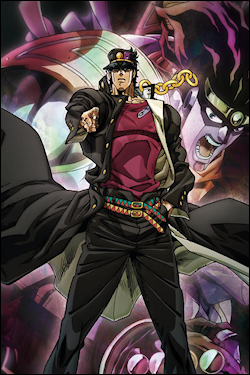 Yellow Temperance was able to mimic Kakyoin because his Stand acts like the symbiotes from the Marvel universe. He wears it as a suit and it can change forms. It also appears to be acidic, as a piece of the Stand stuck on JoJo’s hand after the punch starts to slowly eat his hand. Our hero jumps out the window of the car back onto land and attempts to burn the yellow off him with a lighter as Yellow brags from the cable car that Yellow Temperance has no weakness. Instead of burning off, the Stand grows and starts eating more of his hand. He then notices a child in another car and jumps to it. He borrows the child’s popsicle to try and freeze the Stand, but that just causes it to harden and shoot spikes into his hand. A fat lady also in the car reminds him that Yellow Temperance is invincible. Somehow Yellow has beaten him to this cable car and attacks him again. Jotaro then turns to an old family strategy of retreat. He opens a hole up in the bottom of the car and jumps out into the water. Yellow follows and nearly drowns. It seems the earlier brag of invincibility was not quite honest as water seems to not effect the Stand, but the user still needs to breathe, and he can’t protect himself from underwater attacks, as he needs to get to the surface to breathe. Yellow gives up, stating he’s only fighting for monetary gain. Under some aggressive duress, he reveals to JoJo the names of future Stand users’ Stands and some insight into The Hanged Man’s Stand, as he is the killer of Polnareff’s sister and is somewhat known as the son of the old witch helping Dio. Thinking he has the upper hand, Yellow once again attacks through a drain from a manhole. Apparently the money he was fighting for was 100 million dollars, well worth another attempt. I say “attempt” because JoJo counters it with his own attack through the drain using water pressure. Once again, Yellow tries to surrender, but JoJo has no mercy for someone who would surrender then sneak attack and pounds him with Star Platinum. With that enemy defeated, our heroes resume their trek to Egypt, traveling towards India. JoJo is having a sundae while Polnareff is given the details about the man who murdered his sister. 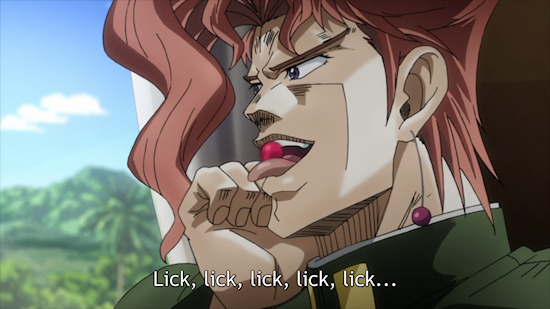 Kakyoin asks for JoJo’s cherry, as cherries are his favorite. 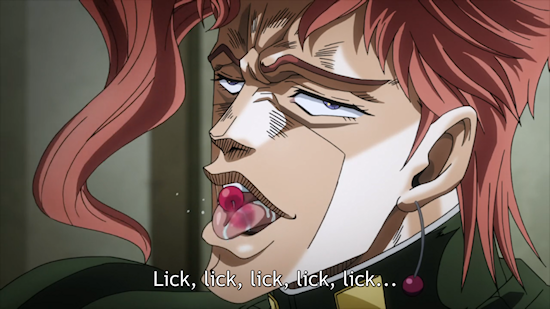 He licks the cherry in the same way Yellow did when he was pretending to be Kakyoin. How did Yellow know about this odd trait? Who knows. The team talks about how Anne has met up with her father and is no longer traveling with them, but we see her in the car next to theirs saying JoJo’s name. Elk was attacked by The Editor, but overcame the attack and will earn full points as normal! If you were paying attention during the last few episodes, you would have heard the name Silver, who is a magic scientist who’s known for making cool gear and magical innovation. If you were able to connect the dots, you could guess that this Silver could be Tatsuya. 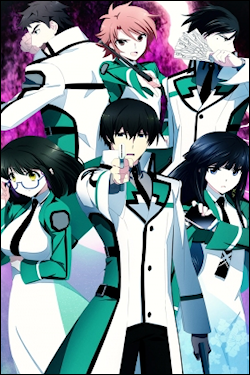 Those suspicions are correct, as the episode starts with Tatsuya being fawned over by his subordinates in a laboratory. He wants to test his flight magic in a more official setting. It works so well that all the testers end up exhausting themselves playing flying tag. 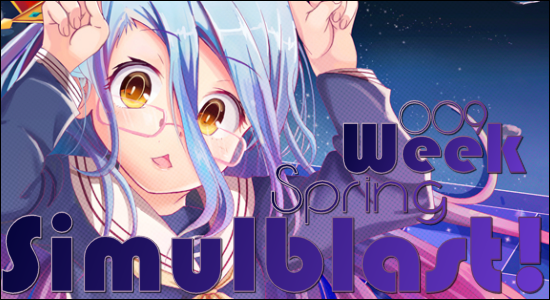 We now turn to Mizuki, the girl with those magical seeing eyes, noticing a classroom full of magical energy. She opens the door to find Mikihiko practicing spirit magic. He freaks out when he got interrupted, but Tatsuya was there to save the day. A short while later, Mikihiko declares that he would have done anything to get his hands on Mizuki (because he wanted access to her rare ability to physically see magic). Now we can finally get to the Nine Schools Competition, which is what the whole arc is about. Since we only got to the point where everyone is on the bus, you think there wouldn’t be much excitement. You would expect some character development and social hijinks, but nothing major is happening, unless you count School Council President Mayumi in a pretty sun dress as a major event (well, at least one of the guys on the bus does). 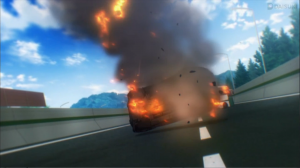 This isn’t a high school sitcom, so someone launches a car at them while they’re riding the bus. How do they deal with it? That’s what the next episode is for! Episode 9 is a bit odd, which I suppose isn’t too strange given how episode 8 ended. Shiro is spazzing a bit since Sora isn’t around, but things aren’t quite what they seem. 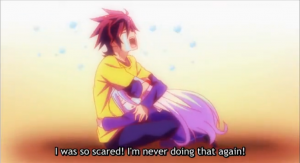 Jibril and Steph both try and comfort Shiro and convince her that Sora is just some figment of her imagination. After a few flashbacks and couple of discussions, Shiro comes to the conclusion that something is affecting all of their memories, which could only mean that some sort of game is being played and none of them know where or between whom. The three girls eventually make their way to the throne room where Steph trips over some Othello pieces placed on the floor. Shiro figures out what the pieces are and begins to try and decipher why they are on the floor by piecing together her apparent complete and utter understanding of her brother. Given the existence of the pieces and that knowledge, she figures out which color her brother is playing, picks up one of the pieces, places it, and wins the game. It turns out that Clammy and her elven friend had challenged Sora to a game and leveraged the elf’s magic to not only have the game take place in some sort of a pocket universe, but also to make it possible for the two players to bet their memories and very existences. Sora, having been challenged, defined the rules for this game and had each of the game pieces represent some portion of each of the players’ memories. When a piece is taken the original owner would lose those memories associated with it while the other player would gain them. Sora effectively set himself up to lose as many pieces as possible so that Clammy would come to understand him and his intent, but as a result knew at some point he’d be unable to continue playing, so added an addendum to the rules stating that each of the players’ companions (the elf in Clammy’s case and Shiro in Sora’s) could take over if they became incapacitated. In the end the gambit worked and he was victorious. 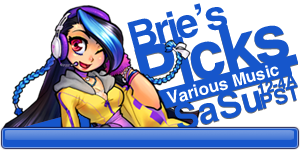 At the conclusion of the game, everyone’s memories are restored minus Clammy’s, and all of the characters materialize in the throne room. The elf begs for Sora to return the comatose Clammy’s memories, to which he offers one of his very blunt responses that makes it sound like he is a terrible person. In the end, he uses the two demands he won as part of the game to restore Clammy’s memories, but also enforce that they each player keep a copy of the ones they gained from the game and then also to demand that he have the ability to alter the elf’s memories as he sees fit. The elf is particularly worried about the last demand, but the now conscious Clammy calms her nerves and says to trust Sora before offering to join forces with the siblings. 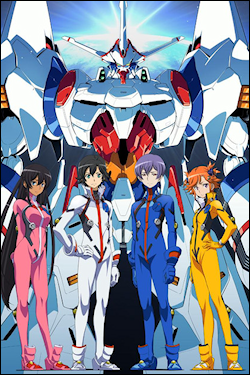 The episode ends with the two pairs of characters hugging each other and crying. This is pretty much how I feel every time I sit down to watch this show. 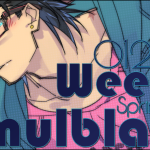 Knightshade has missed the deadline for this week’s Simulblast. He is considered a No Show and gains no points for writing this week. He has THREE more chances to miss before he is out of the competition! Next week’s challenge: It’s time for a little bit of nostalgia! 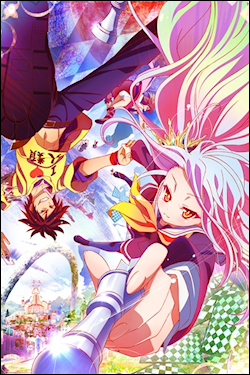 Compare the anime you’re watching to your favorite (or least favorite) anime of all time! I will vote for Elk, becuase not only is that screen shot pratically a meme now, but because that episode was mean.